It was pretty pathetic. 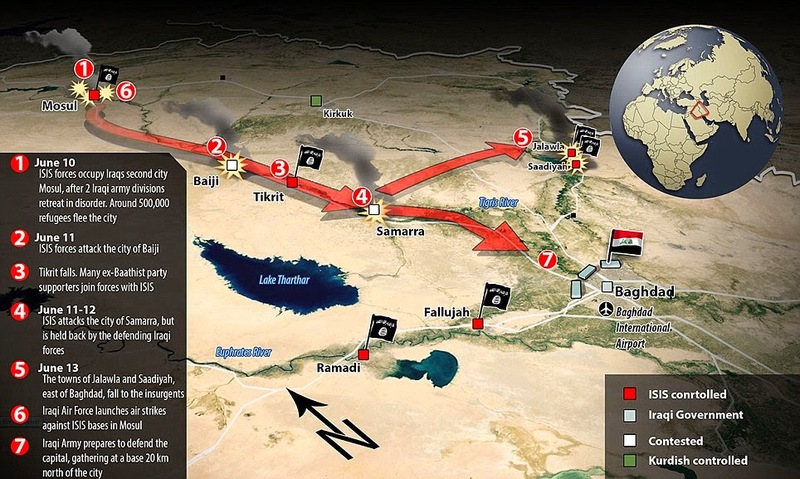 ISIS took control of Mosul and Tikrit (which are pretty bloody far apart!) in 2 days with 3,000 troops. Iraq had a division of 30,000 that totally dissolved under the advance. They've got tanks now, too. And a fat, fat stack of money ($430MM USD, looted from Mosul). Now they've got control of... well, a whole lot. They have way more in Iraq than they even do in Syria, and the Syrian government has been busy fighting with rebels for over 2 years now. Just look at how close they are to Baghdad. There's a weird silver lining, in that their end game is a difficult one, so it may not be an existential threat. 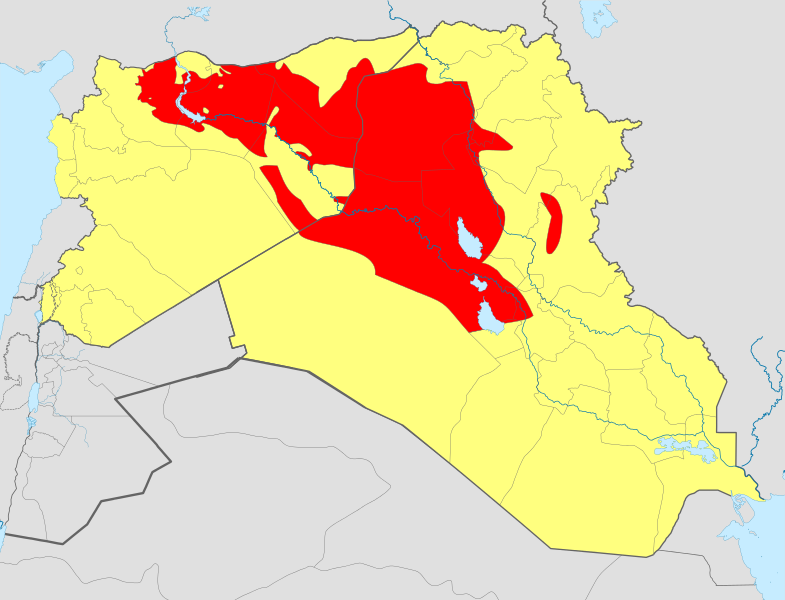 ISIS just can't take over the whole country--there are too many Kurdish and Shiite militias that would rip them apart. So all they can really try to do is create a de-facto (and then maybe formal?) separate state in Sunni areas. This could go something like the Kurdish region, with similar headaches for neighboring countries. It wouldn't happen without a long stalemate. So I don't think these 10,000 ISIS fighters are going to topple the Iraqi government. The Iraqis are mustering the parts of their army that aren't a humiliating mess, and making a counter-offensive (they took back Tikrit, for example). They're getting help (Iran helped with Tikrit and may help with more), and the US may help, although probably not until the most immediate crisis (Obama is putting political-reform strings on any help). They're going after Samarra next. So maybe Iran's help is absolutely critical to Iraq's survival. Obviously the Iraqi army is going to be in need of a dire, dire shakeup. Lots of people joined the army just because it was a source of steady income. Many have strong sectarian feelings and if they're Sunni, they may not want to fire upon their Sunni brothers (same goes with Shiites). These guys just weren't hellbent on defending the Iraqi Republic. A smaller, more selective, better-trained army may end up making more sense. This will come in time. There are a few weird silver linings here. 1) If the Iraqis are able to muster the ability and help to do a serious offensive in Anbar, it may cut off some vital shelters and supply/training depots for ISIS in Syria, and limit the likelihood that eastern Syria actually becomes a permanent terror state. 2) Iran and the US might start getting along. They both want so badly to keep a lid on this that we may see joint exercises and a general putting-aside of differences. The fact that Rouhani is willing to do this is a sign that he's a much more reasonable character, too. Iran/US cooperation would actually bring a whole lot of long-term stability to the general area. We're not at all out of the woods yet. I'll keep you updated.